Recently, Ethan and I were given the opportunity to try out a package of Washy Squashy Sculpting Soap by Sunfeather. If you're not familiar with Sunfeather, you should be. They're an amazing handcrafted soap company, though that lackluster description doesn't do them or their products justice. Sunfeather creates all of their products with care and pride by hand. If you're looking for natural soaps without all those harsh chemicals and dyes, check them out. There is nothing that compares to the scents of pure, organic fruit and plant extracts. Nothing. As I opened the packaging, I was immediately impressed by the size of each bar of sculpting soap. There are six bars in total (Lemon, Vanilla, Berry, Orange, Apple & Mint) and each bar was just that: a full-sized bar. We used the lemon first and I stand behind my initial statement about how nothing can compare to natural extracts. Within minutes of bringing the lemon Washy Squashy soap bar into the tub, the entire bathroom smelled like real lemon -- because the bar is made with real essential lemon oils. The entire half of our house smelled like fresh lemon zest for the duration of the night. It was heavenly. 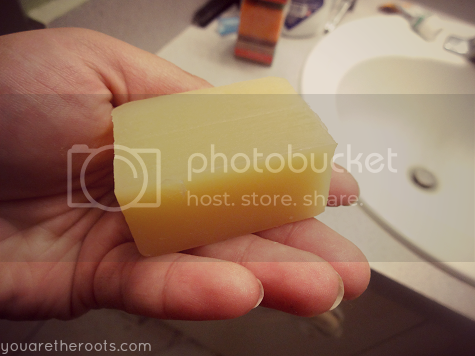 The Washy Squashy soap is as natural as you get. It's colored with natural colorants (no dyes!) and scented by said essential oils and natural aromatics (no artificial fragrances or perfumes!). While the thrill of the Washy Squashy to you, the parent, might be how natural and pure it is, the thrill to the kids is the fact it's sculpting soap! Like a clay for the tub that cleans you. A bath toy that also leaves your skin fresh and soft. Awesome! 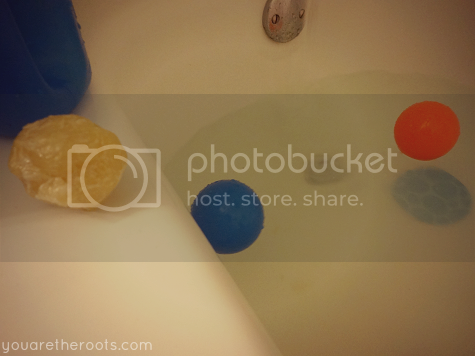 Ethan has been into bringing balls from the ballpit into the tub with him and so on the first night, we made a ball from the lemon soap. 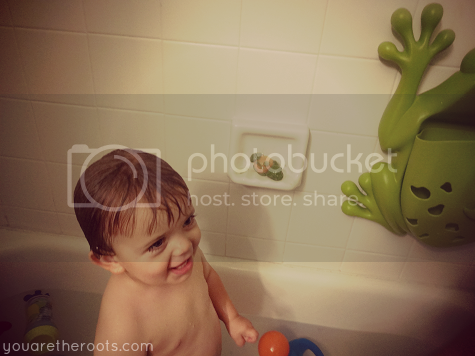 I felt unimaginative, but Ethan got an absolute kick out of the fact he was bathing with a ball. The next night, we made a dog. Yes. That is a dog sitting on the soap dish behind Ethan. No, I'm not a sculptor, but it didn't matter to Ethan. He loved the dog we created. We made it's eyes, nose and ears out of the spearmint soap bar. 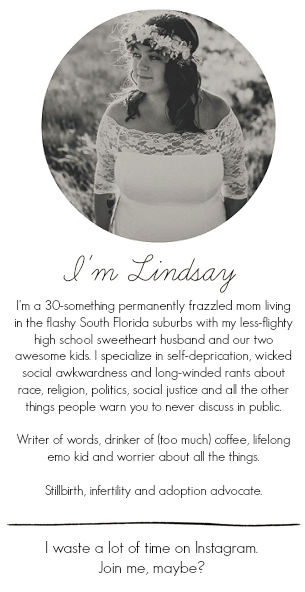 Let me stop and tell you something about the spearmint soap bar: it just might be my favorite thing in the world. As with the lemon soap bar, the entire half of the house smelled like real, pure spearmint. The Washy Squashy soap bars are easy to sculpt with and, if you're not quite sure you want your masterpiece to harden just yet, they're easy to keep moist and flexible, too. You just store the soap bars in a Ziploc bag, wrapped in a damp cloth. I actually forgot the damp cloth after a rushed bathtime one night and left ours just in a bag and a few days later, it was still perfectly pliable. Of course, my husband had to sculpt a fish out of the orange soap bar (which smelled like you were walking through an actual orange grove -- take my word for it, I'm from Florida!) to one-up my decrepit dog sculpture. Ethan was so impressed. He played with his soap fish and soap dog as he did his other bath toys, only this time he got clean in the process. For a toddler with little patience for being scrubbed and washed in the tub when there is playing to do, the Washy Squashy is the perfect solution. 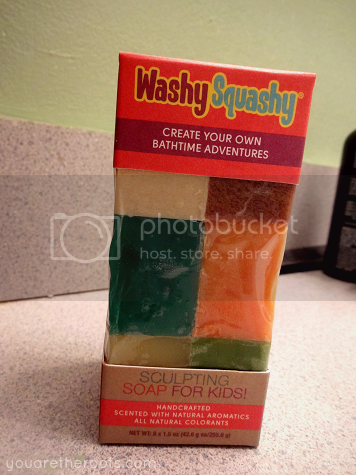 The Washy Squashy retails for only $9.99 and can be purchased on Sunflower's website! For more information on Washy Squashy and Sunfeather, you can also visit them on Facebook or Twitter. and there you go, halloween. the one with the frogs.